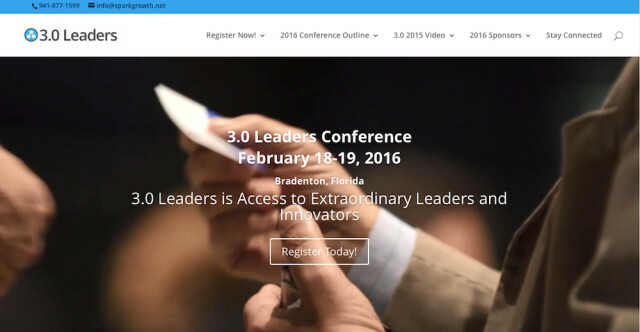 Business, civic and thought leaders making an impact around the globe will convene at the fourth annual 3.0 Leaders Conference Feb. 17-19 at the Manatee Performing Arts Center, located at 503 Third Ave. in Bradenton, the organizers have announced. “What does it take to transform a place when all the rules have changed? From cow town to tech town — progressive cities are no longer chasing smokestacks,” a news release says. These cities have chief innovation officers “and are developing the ‘cool factor’ — attracting new startups and companies, creating high paying jobs and making places that people not only want to live in, but be a part of,” the release adds. In an increasingly global and entrepreneurial world, city leaders “are discovering how public/private partnerships accelerate innovation and growth and how impact investing is changing the landscape of investment,” the release continues. Innovation districts are creating an environment and atmosphere of collaboration that empowers their residents “to live, work and play as they choose,” the release notes. Hand adds in the release, “Attendees will walk away with clarity, purpose and enhanced skills they can use to face their challenges.” Conference registration is limited to the capacity of the Manatee Performing Arts Center, so people interested in attending the event are encouraged to reserve their tickets at https://www.eventbrite.com/e/30-leaders-2016-registration-17488566774. Among those scheduled to speak at the conference are David S. Ricketts, Harvard Innovation Fellow; Glenn Wintrich, innovation leader at Dell; Jonathan Fleece, an attorney specializing in healthcare issues; Nigel Jacob, co-founder of the Boston Mayor’s Office of New Urban Mechanics; Vic Ahmed, founder & CEO of Innovation Pavilion; David Houle, a futurist; Dr. Jeff Bordon, chief innovation officer at Saint Leo University; and Neil Beckingham, director of sustainability at The Mosaic Corp., the release says.